If you don’t have a financial content licensing strategy for millennials, you need one. They’re 75 million strong, they already have $3 trillion in investable assets and they’re just hitting their big earning years. Over the next decade, they’ll inherit another $10 trillion, and $20 trillion more after that. If you’re going to be viable then, you have to engage them now — but millennials don’t engage with financial content as the earlier generations do. They look for a new kind of financial content that teaches as it entertains. CentSai’s 1,700 pieces of innovative financial content are explicitly built for millennials, and our gamified tools and calculators take engagement to the next level. CentSai financial content licensing takes the fear out of finance. Sets of personal stories about crucial millennial money concerns, augmented by tips and insights from experts, and amplified by socially engaging tools, videos, comic strips, quizzes, and podcasts. Jargon-free material that wins trust –by being trustworthy. After three years of testing, we’ve built a library of financial content and tools available for licensing that are informative, authentic, relatable – even binge-worthy. Our ‘arc of engagement’ applies the social style of millennials to a full range of formats, telling personal financial stories in ways that dissolve the barrier between younger consumers, and the financial knowledge that helps them thrive. Most of our content is created by millennials, for millennials, about millennials, and is thoroughly reviewed by experts for accuracy. It works on its own terms — or blends seamlessly into client sites, via iFrame, API, direct feed, FTP, and other methods. We apply your branding, or ours. And from content selection to site integration, you set the timeframe. CentSai writers, contributors and editors start conversations. CentSai readers, in social media hangouts, help them take off. 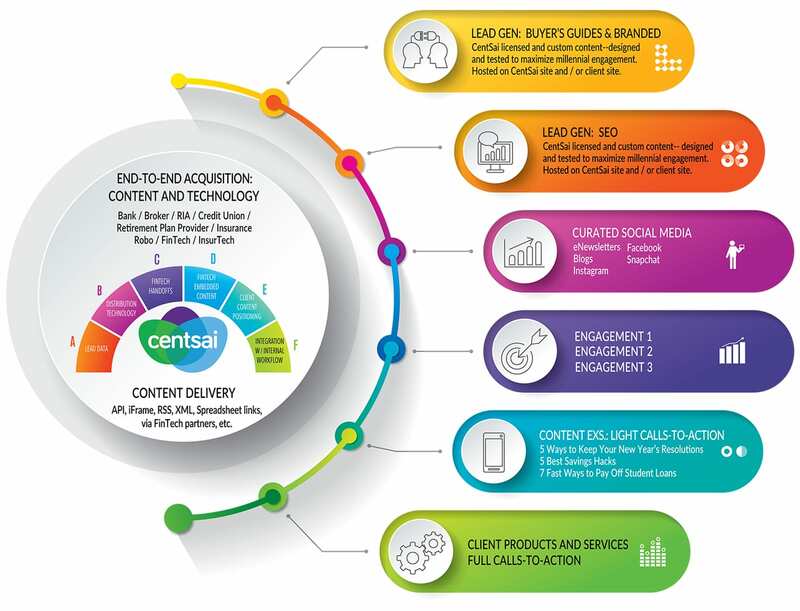 The CentSai Library, refined and tested, includes 1,700+ pieces — tools articles, videos, CentSai Expert thought-leadership, podcasts, social media content, quizzes, plus new forms our team invents — whatever our community tells us works best to get our stories (and messages) across. Is Going Vegan Worth It? Credit Card Rewards: Are You Wasting Your Points? No Credit? There’s an App for That! Is a Matchmaker Worth the Money? Help — I Can’t Afford a Divorce! Are SAT and ACT Prep Classes a Good Investment? Should Using a Robo-Adviser Be a No-(Human)-Brainer? What Happens If You Don’t File Taxes? The Cost of Beauty: Is a ‘Revenge Body’ Worth It? How to Get Gym Discounts: Use Fancy Workout Studios for Cheap! What Is Faith-Based Health Care And Do I Qualify? Home Security Systems: What’s the Real Cost? A Second Opinion on Home Repairs Saved Us $24,000! How to Negotiate Pay as a Freelancer: Don’t Sell Yourself Short! What Is a Reverse Mortgage, and Is It a Good Idea? Insurance 101: Why Should I Buy Disability Insurance? Treasuries vs. Bonds vs. Savings Accounts: What’s the Difference? Is It Better to Pay Off Your Mortgage or Invest? Are You Ready to Protect Yourself Against Identity Theft? Should You Marry for Money or Love? Mental Health Awareness Month: When Should You Go on Medication? Product Life: Make Your Stuff Last Longer and Save Big Bucks! Want to Avoid a Housing Nightmare? Interview Your Landlord! What is a 401(k) Rollover and How Does It Work? Are Bank Bonus Offers Worth Your While? What’s Your Gossip Girl Shopping Persona? What’s the Best Money-Transfer App for You? Google Home vs. Amazon Echo: Is a Digital Assistant Worth It? Affordable Travel: Don’t Miss the Megabus! What Do You Do When An Airline Loses Your Luggage? Camping vs. Glamping: What Makes for the Best Summer Fun? What Job Hits Your Career Sweet Spot?